In the section "Documenting Your Collection" the importance of recording the history and other information about your collection was discussed. If you are the person making the ship and whimsy in a bottle, then you are the one who must begin the process of establishing history by including information with the bottle. All bottles should be identified with important and pertinent information. 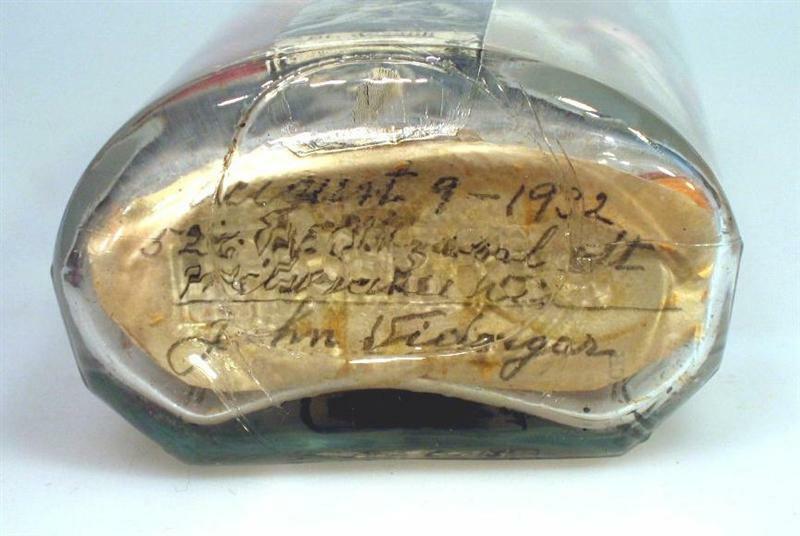 At a minimum, you should put your full name and not just initials and the date the bottle was made, even if it is just the year. I recommend you also include the city and state where the bottle was made. You should also consider adding additional information such as the name of a ship, who a bottle was made for, who’s in a picture that may be in the bottle, a name of a building or an event if it’s a diorama, and similar information when pertinent. This identification should be inside the sealed bottle and not just on the glass or stand. By putting it in the bottle you are not only insu ring that it won’t get lost or separated, but you are also establishing the authenticity of the bottle so that there can be no doubt about it, its maker and when it was made. Give thought to how you can identify your bottles including necessary information without making it cluttered or otherwise causing the bottle to look unattractive or messy. It is important that this identification is readable and will last for many years to come. I have several bottles with identification and information that you can’t read at all or have to guess at what is said. I also have, and have seen, bottles skillfully made and wonderfully detailed but very sloppy writing, poor choice of location for the information, or information written too big, and similar reasons made the bottle less appealing and, in some rare cases, almost undesirable. This isn’t intended to be critical of someone’s handwriting or ability to write but rather a reminder that sometimes we need to take extra care and give much forethought before we start writing. Where do you put your information in the bottle? To a large extent, that will depend on what you are building and what you are building it in. Let’s assume that you are building in a bottle and not another type of glass container. Let’s also assume that whimsys are generally built in an upright position in the bottle and ships in bottles are normally built in a horizontal position. 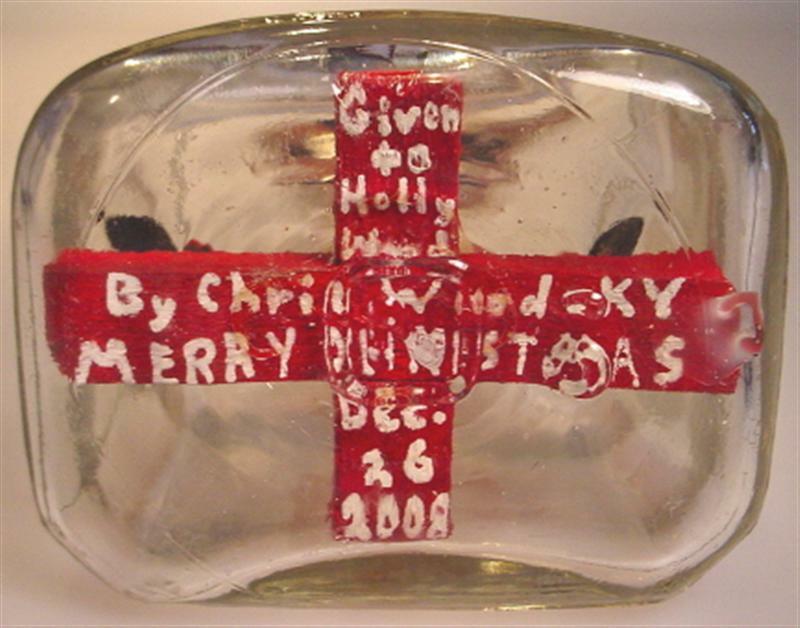 If you are building a whimsy, you might want put the information in the bottom of the bottle on a label glued to the glass so that it can be seen when you look under the bottle. Or, you could consider putting it under a base you have built to support the rest of th e whimsy. These are good locations if the bottom of the container is reasonably clear and without pronounced patterns or distortions that prevent someone from being able to reasonably read the information. If you can’t use the bottom or prefer a different location, writing on or along a wooden shaft or a cross piece if you are making a trick stopper can also be a good spot. An advantage to this approach is that you can generally read the information written in this location without having to pick up or turn the bottle, which can be risky. If you are building a scene similar to the saloon scenes made by Carl Worner, you might want to put on the backside of the structure so it can be seen but doesn’t detract from the scene. Information can be put on the items in the bottle in full view, but again, try to think through what you want to say, how big you should write and then just try to be as neat as possible with consideration given to the spacing. It will help if you take the time to practice writing what you want to say on a scrap of wood that came from the same wood or material used on the actual item in the bottle. This will help you not only determine that you have the room to say what you want to say, but will also serve as a test piece to put in the bottle to see how it looks and how easy it is to read. If building a ship, a label put under the sea, or in the neck of the bottle is a common location. 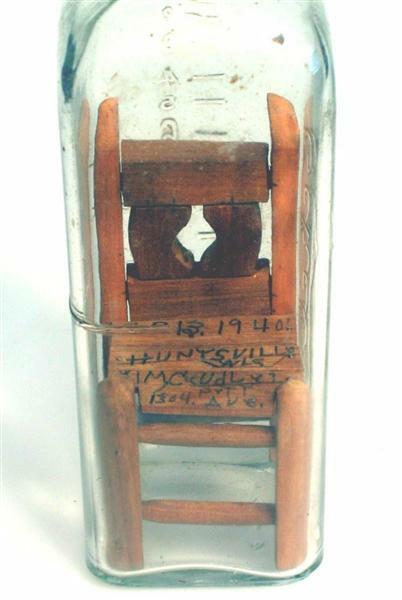 Some artists have ingeniously come up with other unique approaches such as putting the date on a buoy in the water, or on the end of a cork, and even named a fictitious ship after themselves although that approach often leaves doubt if it is the name of the maker or not. I personally don’t like the information written on the cork. The cork will typically age which could make the information unreadable in time, or you may destroy this information if you ever have to get in the bottle for a repair.